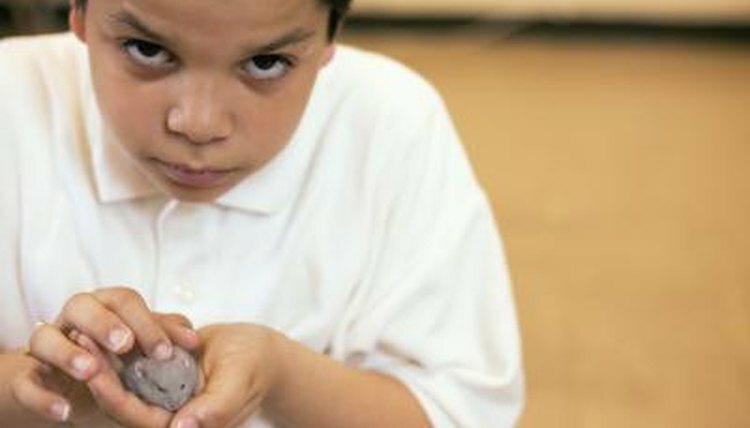 Dwarf hamsters were first introduced as pets in Europe during the 1970s. Since their introduction to the domesticated world, thousands of humans have found a place for these tiny nocturnal animals in their homes. Learning to work with your dwarf hamster's natural sleep patterns will make handling and playing with him more pleasant for both of you. All hamsters are nocturnal. This behavior is the result of natural behavior that aided hamsters survival in the wild. Hamsters have well develop senses of smell and sound while their eyesight is somewhat limited. During the night, wild hamsters could find food and be active with less concern about being spotted or captured by a predator. Being awake at night and sleeping hidden in a burrow during the day maximized the hamster's talents and helped protect it from predators. Dwarf breeds of hamster tend to be a bit more adaptable to different sleep schedules than Syrian hamsters are, but the basic sleep schedules are more or less the same. Your dwarf hamster will likely still be active during the early morning hours, as he is winding down his nighttime activities. Most hamsters will go to sleep mid-morning and wake up periodically through the day in order to change positions, use the bathroom or if they are startled. He will begin to wake up during the early evening and be fully awake come night. Your hamster is at his most active during the night and if you are awake you will see him eating, burrowing, playing and exercising. Dwarf hamsters are generally willing to wake up and play with their humans for short periods of time during the day, but it is best to wait to interact with your pet until he is fully awake. Pay attention to your specific animal and make a note of what time he naturally wakes or goes to sleep then plan your schedule so that you have time to interact with him and perform daily care duties while he is awake. Surprising a sleepy hamster or startling a sleeping hamster can cause aggressive behavior and lead to you getting bitten by your pet. If you do need to interact with your hamster during his sleeping hours, you should speak gently to him and blow lightly on him until he is awake and able to recognize your presence. You can wake your hamster up occasionally to interact with him but repeated interruptions can lead to having a grumpy, irritable and unhappy pet. Its best for your hamster if you let him sleep when he wants to and interact with him when he is already conscious. What Does It Mean if a Hamster Sleeps at Night?